INGREDIENTS: Chicken by-product meal, ground yellow corn, brewers rice, ground wheat, poultry fat preserved with mixed tocopherols (source of vitamin E), dried beet pulp, animal digest, salt, potassium chloride, fish meal, flaxseed meal, choline chloride, zinc sulfate, ferrous sulfate, vitamin E supplement, zinc oxide, manganous oxide, copper sulfate, vitamin B12 supplement, niacin, biotin, vitamin A acetate, calcium pantothenate, thiamine mononitrate (source of vitamin B1), calcium iodate, sodium selenite, pyridoxine hydrochloride (source of vitamin B6), menadione sodium bisulfite complex, (source of vitamin K activity), riboflavin supplement (source of vitamin B2), vitamin D3 supplement, cobalt carbonate, folic acid. FEEDING DIRECTIONS: FEEDING INSTRUCTIONS AMOUNTS TO FEED ADULT DOGS: Food requirements will vary depending on breed, environment, temperment and stress factors. Show dogs and working dogs will require additional amounts of food depending on their degree of activity or stress. Food intake should be adjusted to maintain optimum body weight. Follow the recommended feeding guide below or use the self-feeding method. FEEDING INSTRUCTIONS FOR AVERAGE DOG WITH NORMAL ACTIVITY DOG SIZE WEIGHT DAILY AMOUNT* Toy Breeds 3 to 12 lbs. 1/2 to 1 1/2 Cups Small 13 to 25 lbs. 1 1/2 to 2 1/4 Cups Medium 26 to 50 lbs. 2 1/4 to 3 1/2 Cups Large 51-100 lbs. 3 1/2 to 5 1/2 lbs. Extra Large 100 + lbs 5 1/2 plus cups 1/2 cup for each 10 lbs. of body weight over 100 lbs. *Amounts are based on standard 8 oz. dry measuring cup. HOW TO FEED PUPPIES: Puppies may begin eating MFM High Performance Dog Food at about four weeks of age. Feed puppies all the moistened (with warm water, not hot) food they will consume three times a day until six months old, then twice a day until nine months old. 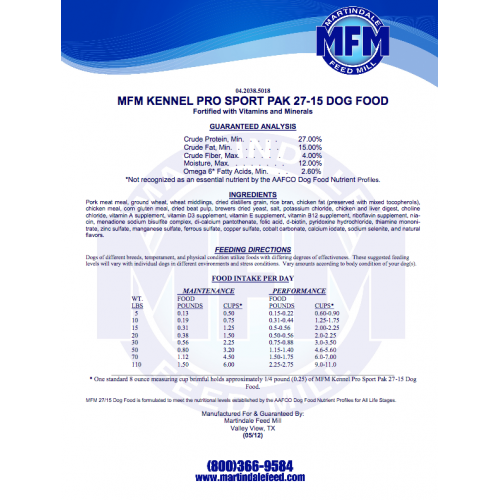 If fed dry, MFM High Perfrormance Dog Food may be kept before the puppies at all times. The amount fed should be sufficient to maintain steady optimal growth and weight, but not so much as to stimulate excessive growth and/or weight gain at an early age. PREGNANCY AND NURSING: MFM High Performance Dog Food provides the extra nutrition needed by reproducing females in stage of gestation and lactation. Food consumption may vary during gestation, so feed the amound needed to maintain the pregnant females good body condition. Food intake may double or even quadruple during lactation. For best result, supplements should not be added, except under the advice of a veterinarian. FEEDING TIPS: Changes in your pets feeding habits should be made gradually. When changing over to MFM High Performance Dog Food, first substitute small amounts of MFM High Performance Dog Food in place of your pets current food. Then, over the next week to ten days, increase the amounts of MFM High Performance Dog Food while decreasing amounts of his other food.